These are so cute! 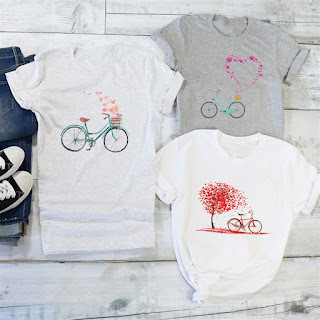 Get a Valentine's Bike Tee for $13.99 (Retail $27.99). This is also perfect to wear throughout the year....doesn't have to be Valentine specific. These Valentine Bike Tees will definitely help you feel the love! They are the perfect layering tee to go under any sweater, flannel, or cardigan! Just pair these with your favorite leggings or skinnies and you've got a perfect outfit! $3.99 for the first item and $1.99 for each additional item. US only. Seller usually ships within 5 business days. Ships no later than Sat, Dec 29.